A little over a year ago Egypt began to report on what would turn out to be the largest human H5N1 outbreak on record, one that over the ensuing six months would result in 160+ infections, and 51 deaths (see EID Dispatch: Increased Number Of Human H5N1 Infection – Egypt, 2014-15). While open at first in their reporting, by late January of 2015 - with the number of cases increasing dramatically - the Egyptian MOH simply stopped providing timely updates on their outbreak (see Revisiting Egypt’s Murky H5N1 Battle). In May, after the outbreak had slowed, we saw the WHO Statement On Joint H5N1 Mission To Egypt, with specific recommendations for addressing the crisis. Except for some preparatory statements (see Egypt Forms Bird Flu Committee & The MOH H5N1 Plan), we've heard little out of Egypt regarding H5N1 this fall. In recent days, however, local media has reported on a number of `suspected cases', all vigorously denied by the MOH. 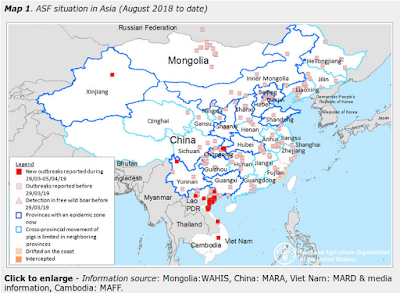 As does China with H7N9, Egypt maintains strict control over the public release of information on their H5N1 bird flu situation. Regardless of whether any of the recently reported `suspect' cases are avian flu, it is once again the time of year when H5N1 usually begins to take off in Egypt. The MOH has issued the following reassuring statement - one that stresses their preparedness to deal with winter outbreaks (Tamiflu, hospital training, a hotline, etc.) - and offers solace in the fact that Egypt only saw a 28% fatality rate in H5N1 cases this year. Alent the Ministry of Health and Population for taking all necessary precautions to limit the spread of the virus, "Avian influenza A / H5N1", especially with the onset of winter, comes within the framework of the ministry proactive plan to contain the disease and minimize the negative effects on the health of citizens in terms of epidemiological surveillance of the disease, and take the highest degree of caution and follow-up and monitor the epidemiological situation of the disease. And the ministry said it has provided the drug Tamiflu anti-viral "tablets / syrup," and insurance stocks a strategic him on a permanent basis, as well as the implementation of programs to increase awareness raising and activate surveillance and early detection of cases, and activate the hotline (105), which runs throughout the day to respond to citizens' questions and dealing with complaints about bird flu. This comes in conjunction with the distribution of all to deal with cases of the flu and bird flu calling at hospitals, as well as for the definition of the situation at all facilities providing health service and private clinics posters protocols. The ministry said that it is training doctors and medical teams in units of basic health care to raise the efficiency of doctors on how to deal with cases of influenza and bird flu and the fight against respiratory diseases infection, also trained to deal with cases protocol, as has been the training of rural leaders to activate their role at the community level on how to Safe handling during breeding birds, and disposal of dead birds and the early diagnosis of cases, as well as raise and improve the capacity of hospitals, through an increase in intensive care beds and coordination for the referral of cases between hospitals.